The 1969 coup by a group of junior officers took the world by genuine surprise. The Revolutionary Command Council (RCC), with Mu’ammer al Qaddafi in their midst, had Libya embark on a new political adventure, one which would last more than four decades. At home, he put great effort into weakening the legitimate sources of power: the monarchy and the religious establishment. At the same time, Qaddafi and the RCC consolidated power through a search for common ground in anti-Western feelings. The revolution proclaimed by the RCC was built on the utopian idea of freeing Libya from foreign influences, in order to uncover a true Libyan national spirit. Dismantling the Anglo-American military bases and expelling a large part of the Italian community were part of this vision. Militant speeches, combined with highly publicized acts of hostility against Western interests served the triple purpose of bolstering domestic legitimacy, attracting attention at the international level, and settling accounts with former occupiers and present imperialists. 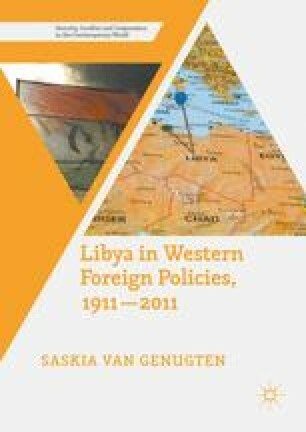 Nonetheless, the RCC and Qaddafi remained aware that their survival, economically and as such also politically, was linked to keeping substantial relations with Libya’s key trading partners in the West.